Semtech Corporation (Nasdaq: SMTC), a leading supplier of high performance analog and mixed-signal semiconductors and advanced algorithms, today announced its participation in the LoRa Alliance™ 10th All Members Meeting (AMM) in Amsterdam from Jan. 29-31. Semtech, a founding member of the LoRa Alliance™ and represented on its board of directors, will collaborate with the LoRa Alliance to help drive mass adoption and global implementation of the LoRaWAN™ open protocol. The three day AMM will take place at the Hilton Amsterdam and will have a variety of events including marketing planning meetings, technical sessions and strategy information panels. The All Members Networking reception will take place in the evening on Wednesday, Jan. 31 with an opportunity to connect with ecosystem members directly to learn how the LoRaWAN open protocol can be beneficial to an IoT use case. With the co-located “The Things Conference” starting on Thursday, Feb 1, this is the ideal opportunity to engage with over 1,000 LoRaWAN developers and Alliance Members in Amsterdam. The LoRa Alliance has experienced significant growth in a short amount of time and today counts over 500 members who closely collaborate to result in more than 45 countries deploying LoRaWAN networks. For more information about the 10th AMM, visit the LoRa Alliance website. Semtech’s LoRa devices and wireless radio frequency technology is a widely adopted long-range, low-power solution for IoT that gives telecom companies, IoT application makers and system integrators the feature set necessary to deploy low-cost, interoperable IoT networks, gateways, sensors, module products, and IoT services worldwide. IoT networks based on the LoRaWAN™ specification have been deployed in over 45 countries. To learn more about how LoRa enables IoT, visit Semtech’s LoRa site and join the LoRa Community to access free training as well as an online industry catalog showcasing the products you need for building your ideal IoT application. 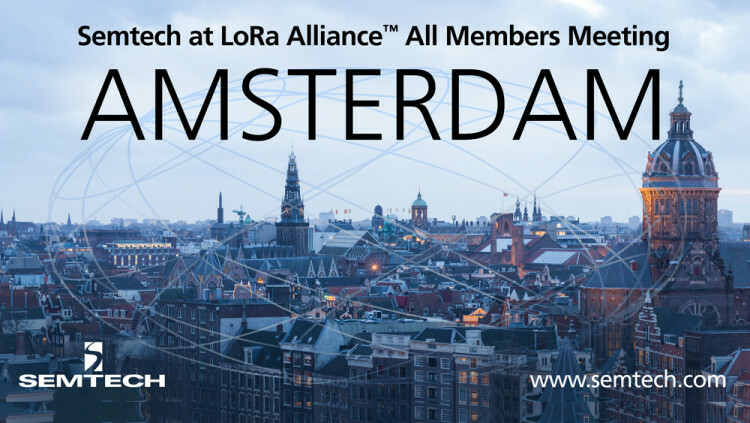 The LoRa Alliance is an open, nonprofit association that has grown to more than 500 members since its inception in March 2015, becoming one of the largest and fastest-growing alliances in the technology sector. Its members are closely collaborating and sharing their experience to promote the LoRaWAN protocol as the leading open global standard for secure, carrier-grade IoT LPWAN connectivity. With the technical flexibility to address a broad range of IoT applications, both static and mobile, and a certification program to guarantee interoperability, LoRaWAN has already been deployed by major mobile network operators globally with wide expansion anticipated in 2017.